Any employed "Specialists" can be transferred to your ship at no cost. Discard any specialists you can't (or don't want to) employ. If the player was a pirate, you get a reward based on how many bounties the defeated player had. Any Mission Card the player may have had is discarded. 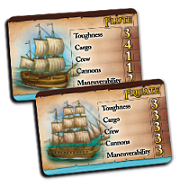 Draw 3 Cargo Cards and get an amount of Gold equal to the Plunder Value on the drawn cards. Randomly discard a Cargo Card for each hit the Naval ship took to its cargo. The remaining goods are yours to keep. Keep the ship, if you wish. The pirate Frigate and Sloop have no cargo or Gold onboard. However, if you are a non-pirate and you defeat a pirate ship (sink it or win Crew Combat), you get a Gold reward. When you win a boarding battle over an NPC or Player, you may discard your current ship and claim the one you fought. 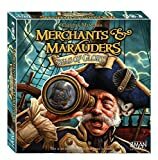 You may transfer: Cargo, Special Weapons, Gold and all your cards freely to the new ship. However, Ship Modifications cannot be transferred.